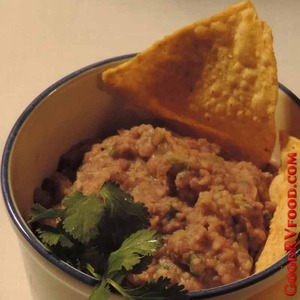 This is a delicious and healthy bean dip that can also be used in burritos or quesadillas. A food processor is handy but you can easily blend this with a fork, potato masher, or a pastry blender which is my personal favorite smashing instrument. 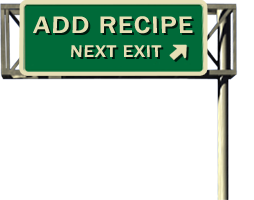 At home I always cook my own beans because it is much cheaper and very easy to do. I like to use frozen green chiles when I have them available. Most grocery stores in the western part of the country carry them. If this isn't spicy enough you can add dried red or green chile for more kick. If you like cheese just add shredded cheese when you reheat the beans and cook until it's melted. Mince the onion and garlic. Heat the olive oil in a medium size skillet. Saute the onion until softened, add the garlic and cook for one additional minute. Add this mixture to the beans and chiles and mash well or process in a food processor until you get a coarse mixture. Return this to the pan and heat until warmed through. Add optional cheese and continue heating until melted. Serve with tortilla chips or veggies.